Six, or maybe 7, years ago we (my ex partner and I) decided we would like some hens. Well, to be honest, it was probably me who decided and he went along with it! Dotty, a Cuckoo Maran, Hetty a Speckled Maran, and Aggie and Betty, two Black Rocks were, you might say, my foundation stock. I bought them from an ol’boy who I thought was a breeder, but who turned out to be a bit of a wheeler dealer, as they say. All four hens were pretty wild, although Betty did become approachable in time. She used to sit on the spade when my ex was digging-over the veg plot. They were very clever (who says that chickens are dumb?) because whenever they saw the fork or spade they would waddle after you as they knew that worms would be in the offing. 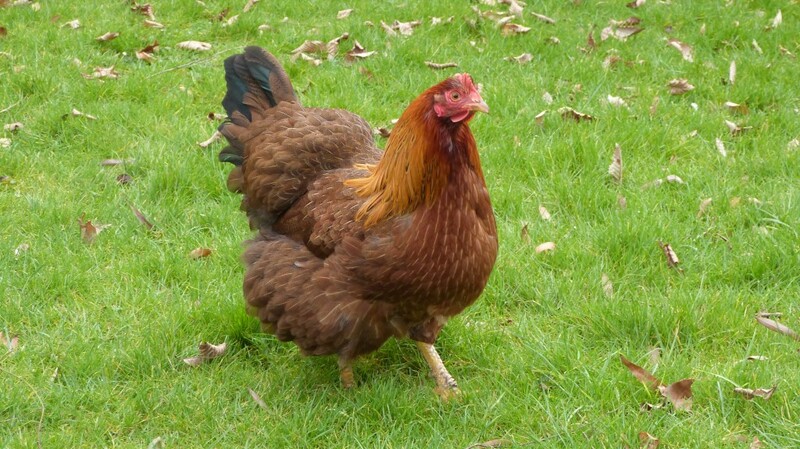 After a couple of years, we were in the garden one early summer’s day and Hetty (the Alpha hen) hurtled past us. Catching a glimpse of bright red on her breast we thought that she had injured herself. Trying to catch her was out of the question… like her three comrades in arms, she was unapproachable. After some investigations, trying to look as closely as we could, we came to the conclusion that her flesh wasn’t broken but was livid red and devoid of feathers. We then discovered that the feathers were all in the nest box, and after doing some internet research we came to the conclusion that she was broody, and indeed she was. We built her a broody coop and bought 6 hatching eggs, including a couple of blue cream legbar eggs, and a Welsummer egg gifted by my neighbour. 22 or 23 traumatic days later, the eggs started to hatch. I say ‘traumatic’ because Hetty was such a good hen she just sat on ‘her’ eggs, refusing all sustinance or inducements to take a walk. After 10 days I was physically pushing her off the eggs (what the experts would have said, god only knows) and covering the eggs with a towel. During those days she hardly ate or drank anything. The outcome was 4 chicks. The other eggs didn’t hatch. Two Rhode Island Reds, a Cream Legbar and a Welsummer. One Rhode Island Red, Boris, and the Cream Legbar, Ozzie, were obviously cockerals. My neighbour took them, we thought to breed with because they were purebreds, but I have a sneaking suspicion that they ended up in the pot, which, between you and me, we were very sad about. 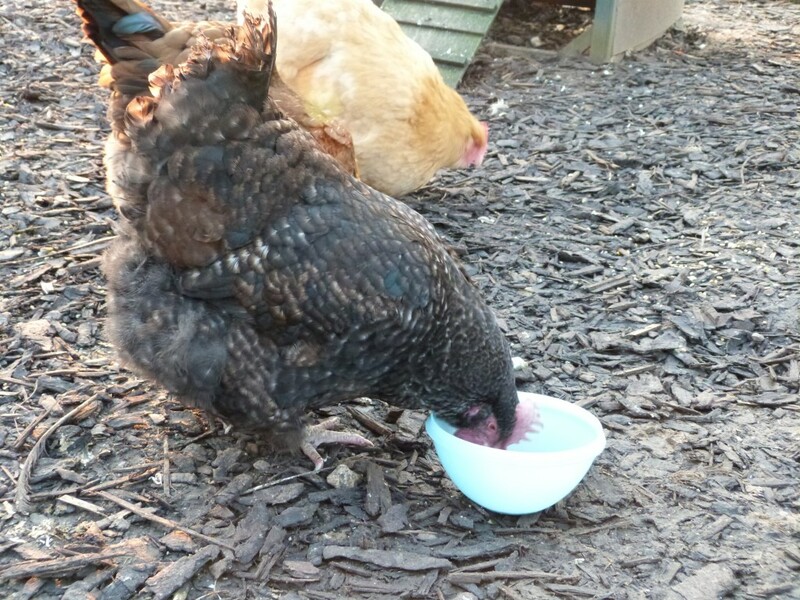 That left Winnie the Welsummer and my lovely Rosie the Rhode Island Red. Sadly Rosie died 2 weeks after getting over an oviduct infection. She had Marek’s disease which paralyses their legs. We lost the two Black Rocks and, in 2009, we added two more to our dwindling flock. A Buff Orpington, aka Buffy and a Light Sussex we named Polly. Sadly, a couple of years later lovely Hetty, Mother Hen, died. Just leaving Dotty, Winnie, Polly and Buffy. 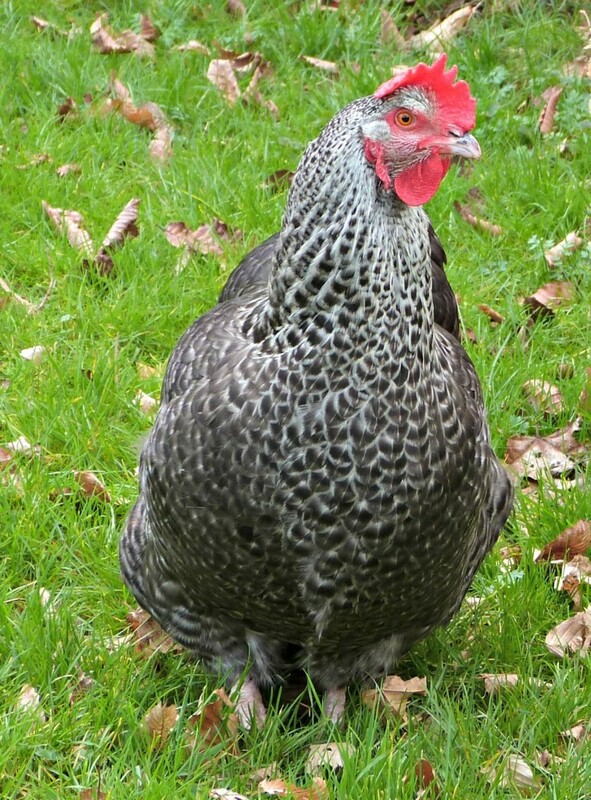 Dotty is in her 9th year and although she laid two or three eggs last year, her egg-laying days are over. Her eggs have always been speckled with blood, so had she been in a commercial flock, she would probably would have been culled at the end of her first year. So she has had a good life with me. Winnie is 6 this year, as are the other two. She has only ever been ‘on the lay’ for 3 months of the year, god knows why. Last year she probably only laid half a dozen eggs. The difficult decision is what do I do with Dotty and Winnie? I have to say that neither of them are very nice, and neither of them are friendly. Dotty is a bit aggressive with the others and Winnie drives me mad because she won’t come in at the end of the day. I have to get booted and coated up, wooly hat as well, just to go outside to get her in before Charlie fox catches her! Last year I felt the time had come to send them to chicken heaven, but I certainly couldn’t despatch them myself. I asked my neighbour if he could do the dastardly deed and he said that he would, just remind him. That was nearly a year ago and I haven’t reminded him. Can’t bring myself to do it. I am finding it difficult to come to terms with actually having an animal’s life terminated. It’s different if they are terminally ill or suffering, then there is no choice, but just because they are too old to lay eggs, and are not very nice characters, is that enough of an excuse to chop off their heads? Am I being too sentimental? Would you be able to do it? I’d find it hard to do that to any animal. I remember when our goldfish died, I couldn’t even bring myself to put it down the toilet. So, with no help here to you, I’d have to say I couldn’t do it either. Glad to hear that. I couldn’t flush a dead goldfish down the loo either! But I would love to have some fresh eggs and Dotty and Winnie aren’t team members, or friendly either. Really need the room so I can have two rescued hens. All very good reasons to cull them, but I can’t bring myself to chase up my neighbour… watch this space as they say! I have to say I couldn’t do it – agree with your criteria for having an animal put to sleep, terminal illness with suffering. If humans came under the same scrutiny as animals I know I’d be for the chop fairly soon, if not already….I understand you need the space but again, is that a reason to chop someone’s head off? I would probably try to introduce another pair of hens and of course as these will be rescue girls it is a kindness and one doesn’t want to prevent them getting a better life either! what a dilemma!!! You cannot even let Charlie Fox have Winnie cos that would just whet his appetite even more!!! good luck, I’m voting for not chopping though…..
Lynda, They are far too beautiful to cull, I am sure there is enough space for another two more friendly egg-laying chickens, and you never know the new arrivals may have a good influence on these two older crochety birds. No, sorry not enough space for six hens. Five at a push, but if I take in more hens I need to take in two, so that they have moral support. Just introducing one hen into an established flock would be cruel. She may well be picked on (our pecked on) without an ally it wouldn’t be fair. Oh dear why can’t Dotty drop dead? Her three companions did. Why do I get stuck with the ‘orrible hen? that’s life I suppose. Buffy and Polly show no signs of laying yet…. I can’t afford to keep 4 hens and not have any eggs. That really isn’t on… Damn them !! Well I’m a veggie so my opinion is keep them until they cark it naturally. Hello Misuss TBAM, lovely to see you here. Well, I’m not a veggie, though I don’t eat much meat, but I still can’t kill things, not even spiders. So it looks as though I’m going to have to continue to buy my eggs from other people. Seems mad when I have four hens!